I’ve always been a lover of sauerkraut. I loved it as a kid and still love it as an adult. I don’t remember when I started making my own but if I asked my wallet I’m sure it would remember 😉 If you are someone who buys or has ever bought raw sauerkraut, you know what I’m talking about. It’s amazing how much money one can charge for a head of fermented cabbage. I spent that money for some time because it was well worth it for me. And while I will still purchase it on rare occasions if the craving hits and I didn’t anticipate that 2 weeks prior, then I splurge. 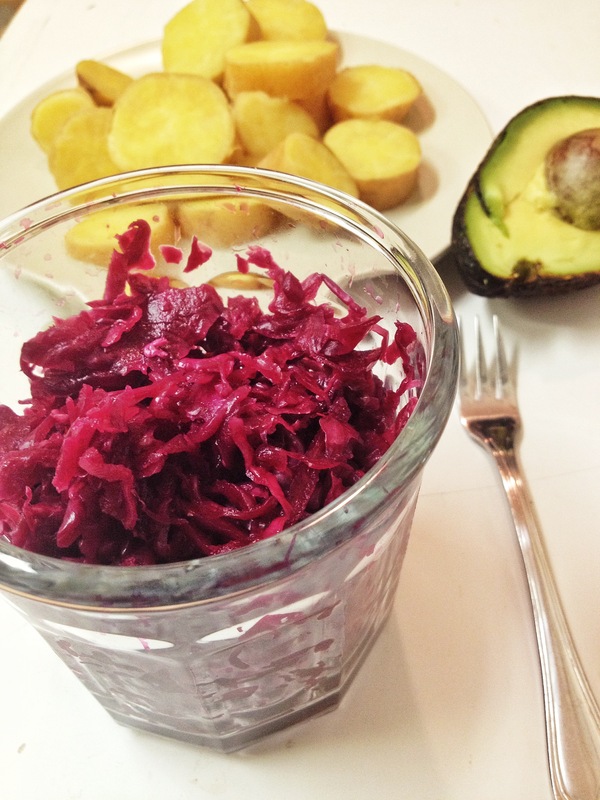 Sauerkraut, which is a fermented food, is a very high source of probiotic, which is essential for good gut health. Having a healthy gut is pretty much one of the best things you can do for you overall health. Have you ever heard that we have two brains? Our actual brain, and then our gut, or “second brain”? Well it’s true. Our gut holds so much information that it is imperative we take care of it. Eating fermented foods such as sauerkraut, kimchi, kombucha, amongst many other things, is a great way to introduce probiotics to our systems. While I make the plain and simple version more frequently, I like to play with the flavors every now and then. 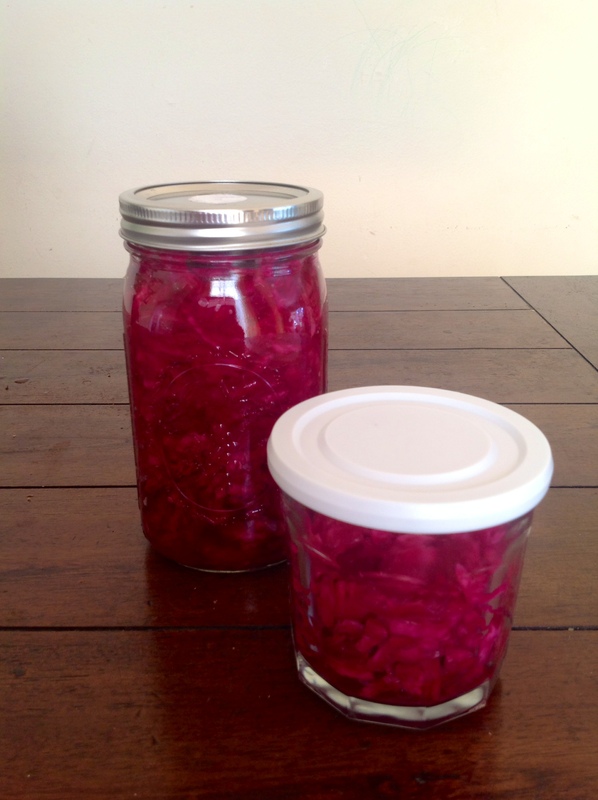 My latest kraut creation is a beautiful combination of red cabbage, beets, and red onions. Not only are we getting the benefits of fermentation here, but we are adding all the health benefits of raw beets (great for blood health and liver cleanser) and onions (awesome immunity booster). This batch came out surprisingly mild in flavor while still containing that delicious fermented taste that I look for. If I would have let my sauerkraut sit for a few more days, I probably would have gotten a stronger flavor, which would have been awesome as well. I’ve been introducing sauerkraut to my kids since they were babies, and they all like it. They are not always in the mood to eat it but I keep on presenting it to them, and some days they eat happily. I think it’s important we give our kids plenty of chances to eat “funky” foods without pressure in order to teach them about variety and so they can be familiar with all kinds of flavors of health boosting ingredients. Go slice yourself a cabbage and enjoy one of the cheapest ways to eat your way to a healthy gut. One of my favorite lunches recently has been this sauerkraut combined with some avocado, yellow yams, and whatever fresh greens I have growing in my garden. I actually crave eating that most days! 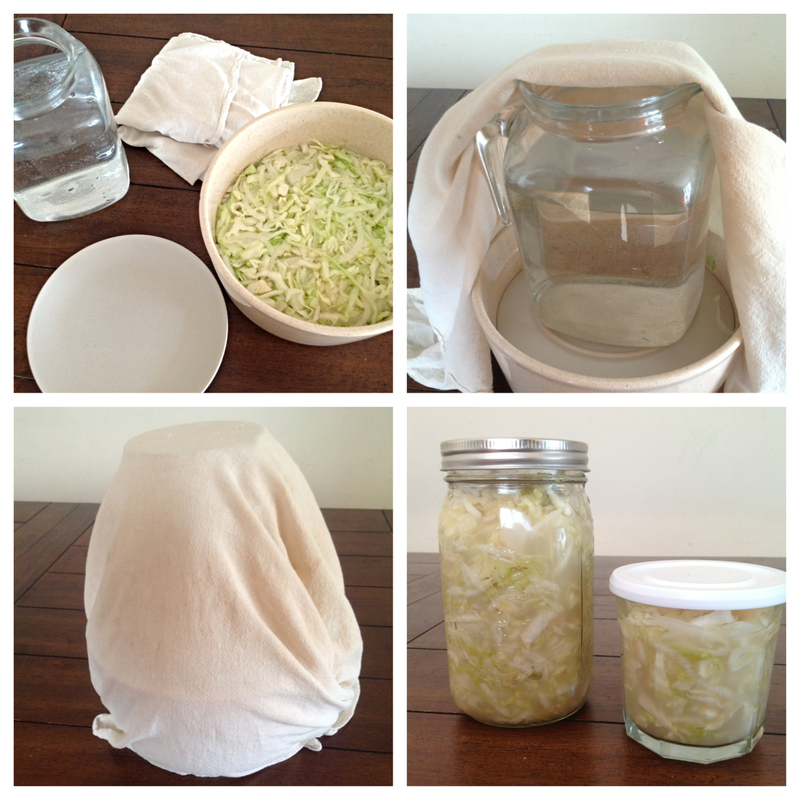 either use this method here, or put your mixture in a large mason jar with screened lid covered with a piece of fabric (to keep bugs out) and press it down every few days to make sure the cabbage remains submerged in water. This is imperative or it will go bad! let it sit on your counter or any place out of the way, for at least 2 weeks, taste it and let it sit longer if you want a stronger flavor. when you are satisfied with the flavor, put it in sealed jars and keep it in the fridge for weeks! Always taste your mix before getting it to ferment and adjust the salt accordingly. A too salty kraut is a real bummer. I love sauerkraut. The live cultures and probiotics do wonders for the body and I think it tastes great. As usual though, buying it at the store is expensive, all things considered, and doesn’t always guarantee the freshness and quality of the ingredients. So I make my own. And it’s deliciously inexpensive and easy!! Slice the cabbage very thinly, as well as the onion. Put all the ingredients in a bowl and toss well. As shown in photos above, place the plate on top of the mixture, put the jug on top of the plate then put a towel over everything to keep from dust or other dirt particles to enter, then leave this on your counter top or anywhere it won’t be in your way and wait for the deliciousness to create itself! It will take about 2 weeks, depending on the heat where you live and how strong of a flavor you like. I recommend tasting it to see if it is done to your liking before bottling it. Check the mixture every 3 days and skim off any layer of bacteria you see forming. The first time you make sauerkraut, you might get grossed out with this part of it, but just remember if you love to eat it, that’s the way it is done, even when you buy it at the store. And it is SO good for your body!!! Once done put it in a sealed container and it will keep for weeks in the fridge. The flavor will mature with time.